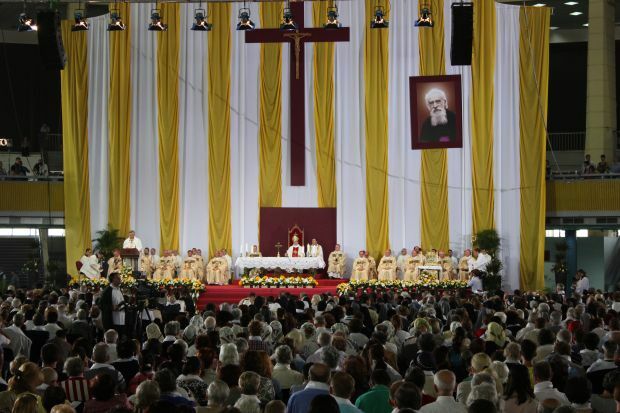 BUCHAREST, Romania (CNS) — A pavilion designed for trade fairs became Eastern Europe’s biggest church when more than 10,000 people participated in the beatification of Msgr. Vladimir Ghika, tortured to death at age 80 in 1954. The Aug. 31 ceremony, broadcast live on Romanian TV, brought together the country’s two major Catholic rites: Latin and Byzantine, whose members use an Orthodox-style liturgy. Blessed Ghika had the unusual authority, approved by Pope Pius XI, to celebrate liturgies in both rites. As believers from across the country flowed into the massive, round hall, volunteers greeted each with a scarf to wear, printed with the martyr’s serene face and signature white beard. Hundreds of priests and bishops processed toward an altar emblazoned in Vatican colors, yellow and white, offset by a large red cross, the color of martyrdom, as a brass ensemble conveyed the solemnity of an event marking a face-off between holiness and brutality. “He was treated worse than a dog in jail, this beautiful elderly priest,” said Hermina Idomir, an 80-year-old Romanian Catholic professor from Brasov. “Everyone knew of his goodness — he started the first free clinic in Bucharest, the first ambulance service. He was a prince but preferred the poor. And the communists arrested him for writing a letter to the pope,” said Idomir, shaking her head. Blessed Ghika is the third Romanian priest, killed by the anti-Christian dictatorship, to be beatified since 2010. — His “ecumenical heart.” Blessed Ghika promoted the unity of Christians long before it was fashionable. Baptized as an Orthodox Christian, he converted at age 29 in Paris, where he was ordained at age 50. 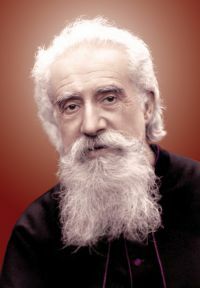 — His service to the marginalized: Although descended from nobility on both sides, Blessed Ghika was most concerned for refugees, prisoners of war, the sick and wounded, for whom he ministered in France, Romania, Italy, Japan and elsewhere. In the words of Pope Pius XI, Blessed Ghika was a “major apostolic vagabond” who, wherever he traveled, converted souls impressed by his godliness. — He suffered and died at the hands of “the pitiless Stalinist regime,” as calm and devout as he had lived: resisting torture, reciting the rosary, reassuring his fellow prisoners. Warned to leave the country when the communists took power in 1948, he refused to abandon those in need. 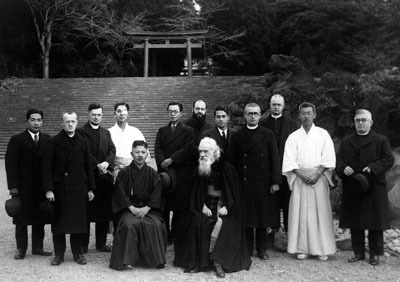 Thirty direct witnesses testified to Blessed Ghika’s holiness in the face of torture. The priest was beaten so badly that he lost his sight and hearing, and his captors set up mock firing squads to break his will. “I don’t think I will see an event this beautiful again in my life,” said Orthodox participant Radu Ciuceanu, incarcerated by the communists for 17 years.